JAM is the Ultimate Native Instruments Software Controller for Music Production, bundled with Komplete 12 Ultimate software. JAM is the Ultimate Native Instruments Software Controller for Music Production, bundled with Komplete 12 software. JAM is the Ultimate Native Instruments Software Controller for Music Production. The latest member of the Native instruments controller family, the Maschine JAM is a production and live performance controller designed for hands-on sequencing and expressive stage performances. Designed to work perfectly with Native Instrument's MASCHINE software and an excellent addition to your Abelton Live setup. The JAM is an exceptionally good looking controller, not least because of its 8x8 multicolour click-pad matrix, one of the best presented 8x8 arrays we've seen of its kind. The grid has a number of functions, foremost it provides you with a step sequencing platform with both piano-roll and gate modes, additionally, they work as responsive triggers when using the JAM as a drum pad or in keyboard mode. 'Keyboard mode' allows you to select your prefered scale and chord values before taking to the pads, which greatly optimises your writing process, paired up with the JAM's built-in arpeggiator it opens up a lot of creative options. Eight dual-touch Smart Strips with dedicated LED meters adds a game-changing element to the Maschine JAM that is seldom found on other control pads. These strips can act as group faders, adjust parameters, integrate effects, play individual notes and even finger-strum chords in key on various scales. Each strips adjacent LED meter gives a clear indication of values and looks pretty great whilst the pad is in use. To increase your production efficiency, the JAM has full transport controls including a D-pad and dedicated encoder wheel that integrate directly with MASCHINE software, allowing you to navigate through and find samples, instruments and effects when in browse mode. The grid also provides fast access to your scenes, patterns and groups. Working seamlessly with MASCHINE software, you can organise and trigger your clips using the Jams intuitive group system. Each column is scene, each button down that column is a pattern which can be selected and triggered, build and perform your tracks in real-time using an efficient and accessible system easy to master. 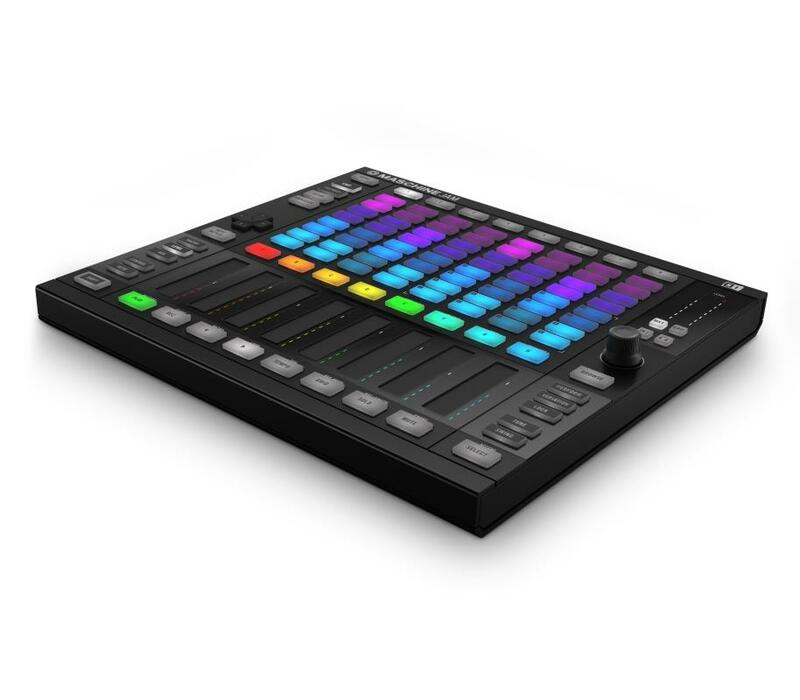 An excellent feature for exciting live performances is the Maschine Jam's 'Locking' ability. Save your current parameters by hitting the lock button, manipulate your sounds in real-time, then return to your original parameters by once again hitting the lock button. A great tool for sweeping build-ups or break-downs in your live performances or to simply accent sections of your tracks. The Jam is built to work seamlessly alongside all controllers in the MASCHINE hardware range, perfect synchronicity meets zero latency, intuitive control and un-told performance capability. Create beats, chop up samples and waveforms with the MASCHINE's pads and controls then send them straight over to the Jam to be launched as patterns or grouped and prepared for a later performance. 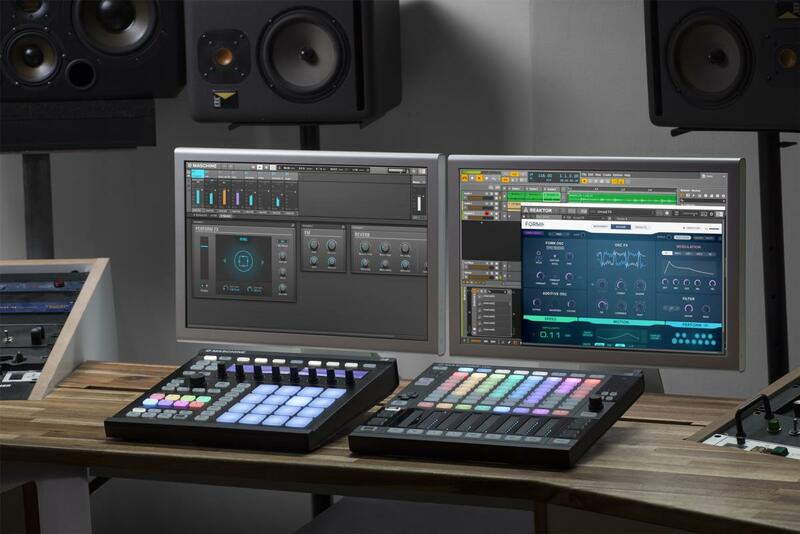 Register the MASCHINE Jam to receive a download of KOMPLETE 11 SELECT, a collection of essential instruments and effects catering for a vast array of genres. Featuring over 25GB of instruments and effects including the pivotal MASSIVE synthesiser and legendary SCARBEE MARK I electric piano among many more.